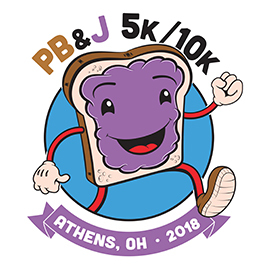 This Father's Day (June 17) the Athens Professionals for Philanthropy will be hosting the 5th annual PB&J 5k/10k and Kids Run to benefit the Athens County Children Services Peanut Butter and Jelly Project. This project provides food for school children in Athens County during the summer. This year we will hosting a Kids Dash (100 Yards), Kids Mile, 5k and 10k. Come out with your family and participate in a race! The Kids Mile, 5k will begin at 9:00 AM on Sunday June 17. The 10k will start at 8:30am on Sunday June 17. The races will begin at the Eclipse Company town in the Plains (just outside of Athens). This is also the location of Kisers BBQ. Kiser's BBQ will be serving Father's Day brunch at Eclipse following the PB&J race! The races will be "out and back" on the bikepath.